This picture is taken from the balcony at the top of the Französischer Dom, and shows the Deutscher Dom. You're wondering what the Französischer Dom looks like? It's practically a mirror image of the Deutscher Dom! The Deutscher Dom and the Französischer Dom (above) seem quite large when up close... but when you're most of the way up the Fernsehturm - one of the world's tallest buildings - they don't seem so significant anymore. 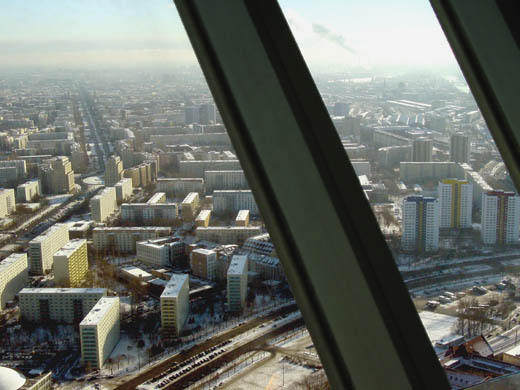 Looking out from the Fernsehturm (TV Tower) over east Berlin. The Reichstag Cupola, designed by Sir Norman Foster, is most impressive when you're inside it! There's a walkway spiralling round the inside of the dome. From here you can look down through the glass and glance the debating chamber way below. It snowed for a lot of my time in Berlin... it was extremely cold at this point when I passed the Reichstag on my last day in the city. It was January, so I guess it's expected. 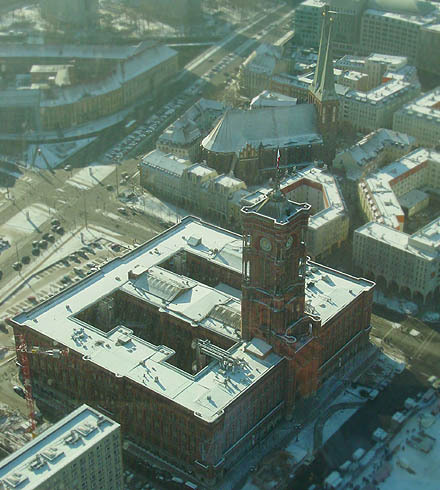 The Rotes Rathaus (red town hall) is an impressive 19th Century building still in use by the Berlin Mayor and Senate. The main railway through Berlin snakes its way across the centre east-west, traversed by loads of ICEs. Just north of the Tiergarten, not far from the Reichstag, Lehrter station is being turned into Berlin Hauptbahnhof (main station). Apparently a north-south track will cross the existing railway at this point. Looking down the spiral staircase in the centre of the Französischer Dom (French Cathedral). 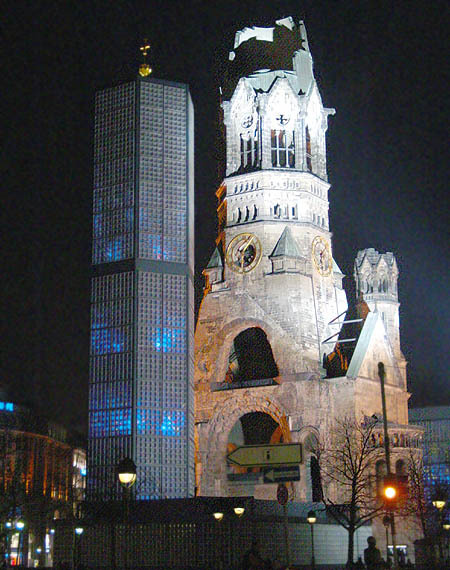 The Kaiser-Wilhelm Gedächtniskirche - most of the church was destroyed in the war; only the damaged tower remains. A new church in a bit more modern style has been built alongside. 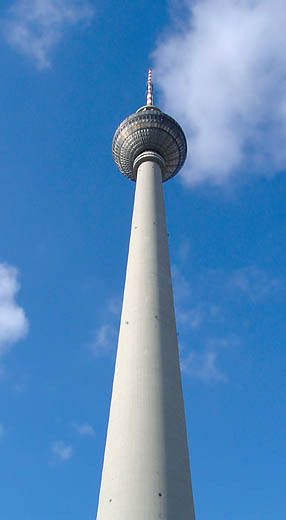 The Fernsehturm (TV Tower) - you can see just how tall it is. The sphere is two-thirds of the way up the tower, I guess. The viewing gallery is situated in one of the lower floors of the sphere. 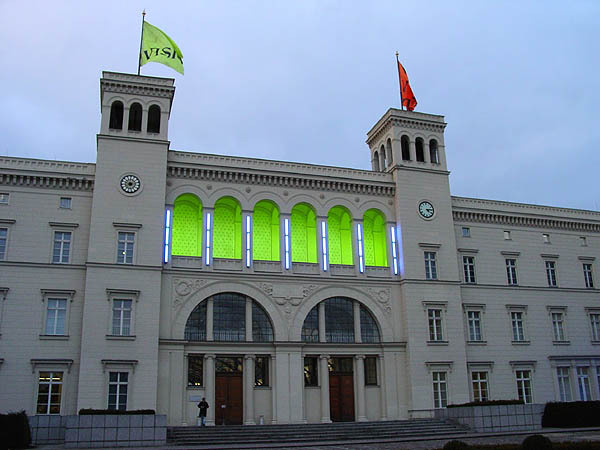 The old Hamburger Bahnhof is no longer a railway station, having been converted into a superb art gallery. The illuminations you see on the front form a work by Dan Flavin. Inside I was particularly delighted to see a great installation by Anselm Kiefer, featuring shelves of huge lead books. I saw a similar work of his at the Astrup Fearnley Museum in Oslo a few years ago. 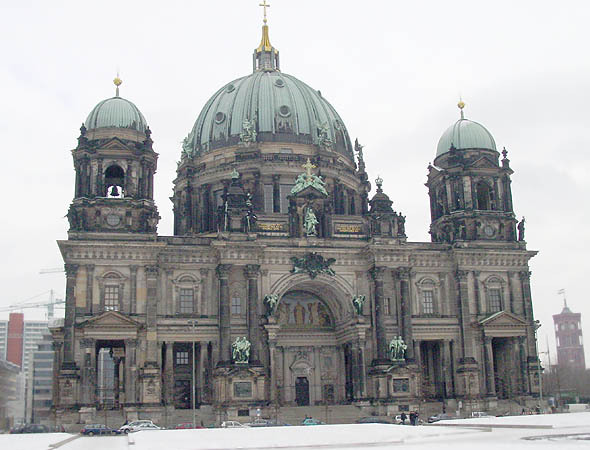 The Berliner Dom. I visited here on Berlin's annual Long Night of the Museums, when many museums, churches and monuments stay open until 2.00 in the morning. I also visited Checkpoint Charlie, the Rotes Rathaus and various art galleries. 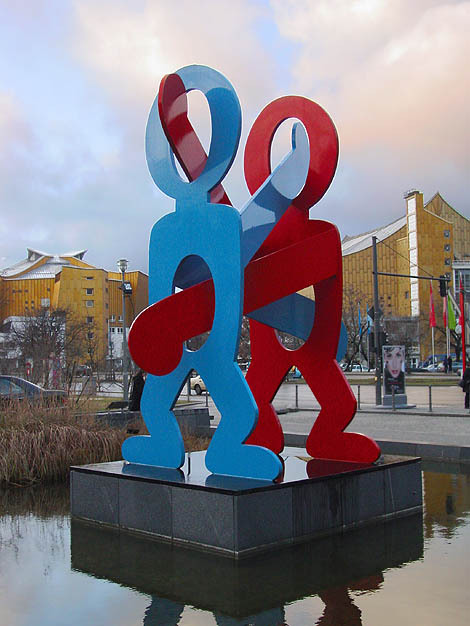 Instanly recognisable as a classic Keith Haring... this sculpture is near the recently constructed commercial and entertainment complex of Potsdamer Platz. 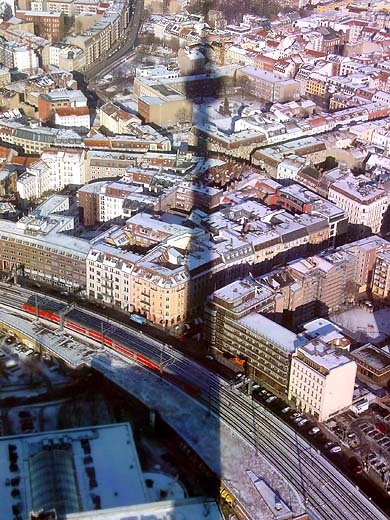 A double-decker RE train passes along the railway under the late morning shadow of the Fernsehturm. 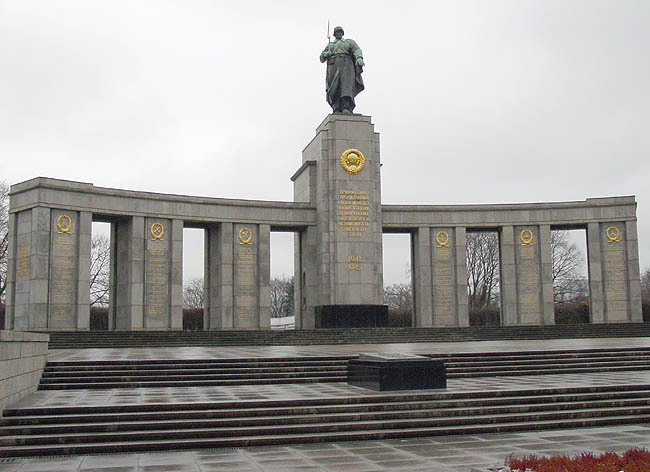 The Soviet Memorial on the Strasse des 17 Juni (17th June Street). This is situated in the middle of the huge Tiergarten park in centre of the city. 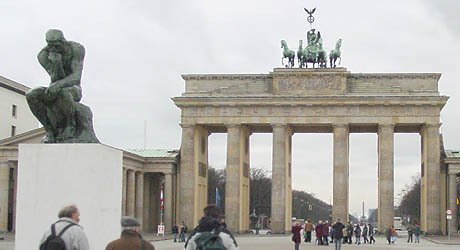 The memorial is flanked by the two first Soviet tanks to enter Berlin in 1945.